THE death of Sir Nicholas Winton at 106 at least shows an exception to the saying that the good die young. He wasn't always a 'Sir' of course. In fact, though hundreds of people owed their lives to this quiet and modest man, it took half a century after what he achieved before his name became famous, and it was not until 2002 that he was honoured with a knighthood. It was Sir Nick of course who organised the rescue of 669 children, mostly Jewish, from Nazi-occupied Czechoslovakia on the eve of the Second World War in an operation later known as the Czech Kindertransport. This involved not only arranging for them to travel safely to Britain, but finding homes for them here, in a country that was not entirely welcoming to refugees, and whose government had been slow, indeed reluctant, to acknowledge the deadly menace represented by Nazism. After the war, Nicholas Winton did not discuss his efforts with anyone. It was only in 1988 that his wife discovered a scrapbook in their attic, with details of the children's parents and the families that took them in. That year the Esther Rantzen programme on TV brought some of these now grown children together with Nicholas Winton, and introduced his name to a wider public. Nicholas Winton was born on 19 May 1909 in Hampstead, London, a son of Barbara (née Wertheimer) and Rudolph Wertheim. His parents were German Jews who had moved to London two years earlier. They changed the family name to Winton, in their bid for assimilation, and converted to Christianity. Nicholas was baptised, and in 1923 he was sent to the newly opened Stowe public school in Buckinghamshire. Leaving school without qualifications, he nevertheless managed to get into banking, first with Midland and then working with banks in Germany and France, before returning to London to become a broker on the stock exchange. Despite his immersion in capitalism, or maybe because of what he learned from it, the young stockbroker was also "an ardent socialist who became close to Labour Party luminaries Aneurin Bevan, Jennie Lee and Tom Driberg." Just before Christmas 1938, Winton was planning a Swiss skiing holiday when one of his socialist friends, Martin Blake, asked him to come out to Prague instead, where Blake was working to help refugees. Many people fleeing repression and persecution in Nazi Germany and Austria had taken refuge in Czechoslovakia, which was now about to become the next victim of Nazi aggression and Western appeasement. On September 30, 1938, the British and French governments signed the Munich agreement, under which Hitler could begin cutting up Czechoslovakia to devour it. Chamberlain came home bearing his bit of paper promising 'peace in our time'. The British authorities were barring refugees and sending people back, and after the Nazis completed their conquest in March 1939, the Bank of England agreed to hand them the Czech gold reserve which had been sent to London for safe keeping. But in November 1938, following the Kristallnacht state-organised pogroms in Germany, the House of Commons approved a measure to allow the entry into Britain of refugees younger than 17, provided they had a place to stay and a warranty of £50 was deposited for their eventual return to their own country. In the limited time he had after arriving in Prague, Nicholas Winton organised the scheme for parents to at least get their children out, on what became known as the Czech kindertransport. The Dutch government had responded to Kristallnacht by closing its borders to Jewish refugees. Border guards were catching them and sending them back to Germany. The children were going to embark on the ferry from Hoek van Holland. Fortunately, with the help of guarantees from Britain, Winton was able to persuade the Dutch to relent, and the children were allowed through. Altogether some 669 children made it to Britain, where Nicholas Winton's mother was among those helping to find them homes. Many of these children would never see their parents or relatives again, as these fell victim to the Nazi murder and concentration camps. Another 250 children were due to leave Prague on September 1, 1939, when the Second World War had begun, and prevented their departure. Nearly all of the children on this last, unsuccessful, train perished during the war. Nicholas Winton remained modest about the work he had done, acknowledging the part played by Beatrice Wellington, Doreen Warriner, Trevor Chadwick and others in Prague who also worked to evacuate children. "Chadwick did the more difficult and dangerous work after the Nazis invaded ... he deserves all praise". Among those who helped find shelter for children in England was Henry Fair, who worked in the Woodcraft Folk, a youth organisation dedicated to helping youngsters acquire a love of the countryside and nature, while instilling values of community and friendship. Arising parallel to the Scouts, but with an affection for Native American lore, and distaste for militarism, and also mixing boys and girls in the same movement, Woodcraft Folk had grown close to the labour movement, especially its co-operative wing. It linked with the Red Falcons youth movement on the Continent. But it was south Londoner Henry Fair particularly who took up the cause of the refugee children. Woodcraft members and parents used to receiving communications from him about summer camps and hiking, usually signed off "Blue Skies", now received a letter about people being persecuted by the Nazis, and appealing for their help to find homes for the children. Fair's daughter would remember meeting refugees at the family's home in Tooting. , the daily paper of the Social democratic party...Of course he had to flee at once. ..the paper was forbidden and its editors were enemies of the new state! So, together with many other anti-nazi refugees, both Jewish and non-Jewish, Czechoslovakia was their first place of exile...Very soon the children of these refugees were formed into a youth group called Die Rote Falken...Some of us Rote Falken had attended an International youth camp in the summer of 1937. It was held in England, near Brighton. ..None of us could guess that two years later Britain would beome our new homeland. "The organiser of this large camp - the head of the Woodcraft Folk - was a young married man, an idealist, keen trade unionist, humanitarian - we all love this man. He was eager to know from our youth leaders what was then the situation in Czechoslovakia and he kept in touch with them after our return from this wonderful holiday. When it became obvious that the Germans had their eye on their Czech neighbours Henry Fair wrote a pleading letter to all members of the Woodcraft Folk, asking them to volunteer to take some of the children whose parents were once again threatened by the Nazis. It must be said that these were working-class families and that, by taking a refugee child, they would certainly have to make financial sacrifices... none of us could imagine that we would never see our parents again - in my case out of 52 members of my mother's extended family, only eight survived two returned from the horrors of Auschwitz and Belsen." (Article from Rosh Chodesh magazine, quoted in Fashioning a New World: A History of the Woodcraft Folk, by Mary Davis). "My mother had many friends, loved parties and nice clothes. We were both members of the Rote Falcons, an international youth movement which had links with the Woodcraft Folk in Britain, Mother as a helper. I have happy memories of the camps we went to. At that time, we little knew that it was probably the membership of this organization that would save my life"
As the Nazis closed in, Susanne's parents and their Jewish friends were seeking ways to leave the country. "This was proving impossible as the world had closed its doors to Jewish refugees. 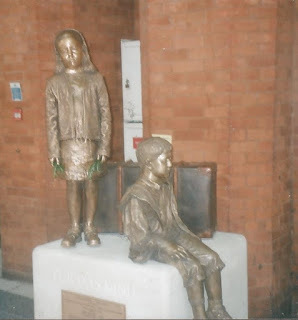 However there were efforts made to bring out children, particularly by a British stockbroker called Nicholas Winton who was on holiday in Prague. He realized the plight of the Jews and resolved to do something. He gained permission from the British government to bring out children, providing he could find families to care for them and a guarantee of £50 per child for re-immigration. In this way he made it possible for 1,000 children to come to Britain. The start of the Second World War prevented the last transport train leaving, but nevertheless he was able to rescue about 680 children. "The demand for places was very high, but I was probably given one because the Woodcraft Folk in England were able to offer 20 homes for Rote Falcons. They were prompted to do so having met up with some of us at a camp in Brighton in 1938. It is difficult to know how my parents felt when they learned that they had been successful in their application for me to be one of these children. I have often wondered, particularly when my own daughters were the age I was then. The decision my parents made to send me must have been a very brave and difficult one, because they knew they could not come with me. Nor did they know whether they would ever be able to join me". "My transport left Prague on 29 June 1939 with about 241 children aged 2-15. I find it difficult to remember how I felt on that day when my parents took me to the railway station, and I became one of the children on one of the last trains to safety before the war started. Perhaps it seemed an adventure, and I certainly did not realize that I would never see my parents again…"
Susan concludes her account thus: "My own beliefs remain intact. My Jewishness is a positive part of myself, although I am not observant. I am on the left of politics, and like to think of myself as tolerant and anti-racist. My hope is that by telling my story, it will help young people to begin to understand what can happen to ordinary people when they become the victims of racism, discrimination and prejudice". (extracts from Susanne Pearson’s account in Survival: Holocaust Survivors Tell Their Story, published by The Quill Press, in association with The Aegis Trust. The British Establishment may have attempted to ease its collective conscience, if it has one, or to make itself look better, by honouring Nicholas Winton with media praise and a knighthood, but what he did went against the grain of government policy at the time, and would be again. He was not really one of them, in fact we could almost claim him as one of ours. Henry Fair moved to Somerset in later years, and became a councillor in Bruton. He died in 1999. Some years before that he had received what he considered the finest of compliments - the discovery that his name was on a Gestapo hit list of enemies to eliminate if they succeeded in invading Britain.